Статтю присвячено визначенню універсального та самобутнього в презентації цінності «розум» на фразеологічному рівні ціннісної картини світу (на матеріалі англійської, німецької, української та російської мов). Цінності в ціннісній картині світу мають релятивний характер, виявлюваний через зв'язок із нецінністю, тобто розкриття змісту цінності, її структурної організації залежить від опозитивної одиниці. Опис специфіки цінності «розум» здійснено за допомогою методу параметричного аналізу семантичної структури фразеологізму з акцентуацією оцінного макрокомпонента та методу тематичних полів. Keywords: evaluation, phraseology, phraseological axiological opposition, value, the axiological world’s image. Background: In modern linguistics the theoretical and practical problems of values, the human's system of values are actively developed and the research of the axiological world’s image fragments becomes actual (see the works of M. Alefirenko, O. Babayeva, R. Batsuren, I. Rus-Bryushynina, O. Serebrennikova and others). In the article the axiological world’s image is considered as the comprehension of the world by man, fragments of this world and the status of the human personality in this world through an appraisal of categorization in opposition to values and non-values. The important element of the axiological world’s image is the evaluation – intellectual and psychic act, revealing a positive or negative feature of the subject stipulated by acceptance or rejection of a value. The values are the phenomena, which were evaluated very positively. The applicability of the article is determined by the absence of specific studies dedicated to the analysis of the mind value in English, German, Ukrainian and Russian phraseology. Purpose: The purpose of the work is to identify the specifics of presentation of the mind value at the phraseological level of English, German, Ukrainian and Russian axiological world’s image. The sources of the factual material are the reputable publication phraseo-graphical publications in English, German, Ukrainian and Russian. Results: The description of the mind value's specificity in the article is performed with the help of the method of parametric analysis of the phraseological unit's semantic structure, proposed by V. Zymin, with the release of the evaluative macro-components, and the basic method ideographic linguistics, the method of thematic fields, that is, via the phraseosemantic fields, phraseosemantic groups (PhSG) and phraseosemantic subgroups (PhSSG), where the value is the phraseosemantic field, within the article's problematics it is mind, and the PhSG is the elements of phraseosemantic axiological opposition, and the PhSSG is interpreted as a set of phraseological units combined by the differential seme, which binds their oppositional relationship of similarity or contrast. The phraseological axiological opposition (PhAO) is understood as a unity of two blocks represented by phraseological units: the first is formed by phrasemes, semantics of which correlates with the values, and the second is made up by phrasemes, semantics of which correlates with non-values. Discussion: The structure of the mind value represents the mental qualities of the natural mind or its loss and is presented in the analyzed the axiological world’s image by three phraseological axiological oppositions: the PhAO «Mental adequacy – mental inadequacy»; the PhAO «Return of ability to think reasonably – the loss of the ability to think reasonably» and the PhAO «Mentally healthy – mentally ill». Asymmetry towards negative evaluation can be observed in all languages. Much in common can be seen in the methods of evaluation: 1) the presence of the connotative seme of ‘depreciatingly’, ‘familiarly’ and ‘playful’ fixed by the phraseo-graphical sources in the composition of the phraseological meaning; 2) the presence of the associative components (somatisms, zoosemisms, phytocomponents, onyms, colouring, numerical and meteorological components) in the composition of the phraseological unit. However, in the means of expression the associational reflexive the specific is revealed (zoosemisms bandicoot, bat (English), cuckoo, goose (Germ. ), beetle (Ukr. ), gelding (Russ. ); phytocomponents nut (English), pear, kidney beans (Germ. ), cabbage (Ukr. ), spruce, Birch (Russ. ); meteorological components rain (English); onyms Billy, Colney Hatch (English), Hesse (Germ.) etc.). The prospects for the research include the increasing number of studied languages and focusing on the comparative aspect of the phraseme level of axiological world’s image with projecting on a national character. Zhanna Krasnobaieva-Chorna is Doctor of Philology, Associate Professor, Professor of Department of General and Applied Linguistics and Slavonic Philology at Vasyl’ Stus Donetsk National University. Her areas of research interests include phraseology, cognitive linguistics, comparative linguistics, lexicographic linguistics. Ключові слова: оцінка, фразеологізм, фразеологічна аксіологічна опозиція, цінність, ціннісна картина світу. In modern linguistics the theoretical and practical problems of values, the human's system of values are actively developed and the research of the axiological world’s image fragments becomes actual (M. Alefirenko (Alefirenko 2010), O. Babayeva (Babayeva 2004), R. Batsuren (Batsuren 2010), Zh. Krasnobaieva-Chorna (Krasnobaieva-Chorna 2017), I. Rus-Bryushynina (Rus-Bryushynina 2010), O. Serebrennikova (Serebrennikova 2011) and others). The axiological world’s image (hereinafter AWI) according to V. Karasyk, is the system of moral values, ethical norms and rules of conduct, reconstructed in the capacity of the interlinked value judgments which are relevant to legal, religious, moral codes, the generally accepted judgments of common sense, typical folklore and known literary subjects (Karasik 2002). The main features of AWI in the course of the linguistic analysis according to the linguist's opinion, are: 1) the existence of universal and specific components (various appraisive ratings of the objects, the combinatorics of the values); 2) there are the relations of inclusion and associational overlapping between the value judgements, which allows to set the value paradigms of culture; 3) the AWI in the framework of one linguistic culture turns out to be non-uniform because different social groups may have different values; 4) it exists in collective and individual consciousness, etc. In the article the axiological world’s image is considered as the comprehension of the world by man, fragments of this world and the status of the human personality in this world through an appraisal of categorization in opposition to values and non-values (Krasnobaieva-Chorna 2017: 225). The important element of the AWI is the evaluation – intellectual and psychic act, revealing a positive or negative feature of the subject stipulated by acceptance or rejection of a value. The values are the phenomena, which were evaluated very positively. The storage facility of the system of values, in R. Batsuren's opinion is the phrasicon (Batsuren 2010). The applicability of the article is determined by the absence of specific studies dedicated to the analysis of the mind value in English, German, Ukrainian and Russian phraseology. The purpose of the work is to identify the specifics of presentation of the mind value at the phraseological level of English, German, Ukrainian and Russian axiological world’s image. The material of the investigation comprises phrasemes, taken from trustworthy phraseo-graphical publications in English (Oxford Dictionary of Idioms 2004), German (Schemann 2011), Ukrainian (Dictionary of phraseological units Ukrainian 2003) and Russian (Phraseological dictionary of Russian 1987). The main body of representing phrasemes of the the mind value is formed of 500 phraseological units. The mind in terms of modern psychology is a structure of human's mental abilities and their level of knowledge of the world. By the mind one also understands the mechanism of mental adaptation of a human to different life situations, which is an adequate evaluation of the interconnections and laws of reality, as well as the involvement of a person in the society cultural experience. PhAO «Mental adequacy – mental inadequacy». PhSG «Mentally adequate» actualizes ‘smart’, ‘quick-witted’, ‘intelligent’, ‘gifted’ semes: have (got) a (good) head on one’s shoulders; have (got) one’s head screwed on right (the right way); all there; (as) bright as a button; a clear head; Germ. einen klaren (offenen) Kopf haben; ein Mann von Geist; ein Mann von Kopf; Grütze im Kopf haben; Ukr. не з дурного десятка; бистрий на розум; не в тім’я битий; голова не половою (не соломою, не клоччям і т. ін.) набита; золота голова; розумна (твереза, мудра і т. ін.) голова; розуму не позичати; всі розуми поїсти; [є] спичка в носі; шарики працюють; казанок (баняк, макітра) варить, fam. ; є лій у голові, playf. ; мати [всі] клепки в голові, playf. ; мати олію (лій, рідше смалець і т. ін.) в голові, playf. ; мати розум [у голові]; мати спичку в носі, playf. ; мати тяму (тямку) [в голові] (1); мати кебету, playf. (1); з розумом (3); Russ. голова [котелок] варит; голова на плечах; ума палата; иметь голову на плечах; светлая голова (1); с головой (1). · clever, quick in any undertaking: Ukr. і швець, і жнець, і на (в) дуду грець. The accompanying semes of PhSG «Mentally inadequate» are ‘unclever’, ‘reckless’, ‘foolish’, ‘weak-minded’, ‘slow-witted’, ‘obtuse’, ‘stupid’: not know enough to come in out of the rain; not (quite) all there, (as) daft as a brush; dead from the neck up; have nothing between one’s ears, deprec. ; (as) thick as two short planks, deprec. ; have (got) a screw loose (missing), playf. ; Germ. dumm wie Bohnenstroh; er ist mit Brettern vernagelt; dumm wie Bohnenstroh (wie die Sünde); er ist so dumm, daß ihn die Gänse beißen; nicht viel Grips im Kopf haben; Heu und Stroh im Kopfe haben; ihm wird der Kopf verkeilt; bei ihm ist eine Schraube locker; ein Narr in Folio (ein Narr in Lebensgröße, ein ausgemachter Narr); schwach von Begriff sein; seiner Sinne nicht mächtig sein; er hat Stroh im Kopf; Mensch, du hast wohl einen Bruch! ; er hat eins mit dem Holzhammer (ab)gekriegt; hart verpackt sein; ein blinder Hesse, deprec. ; Ukr. жуки у голові; зайчики в голові стрибають; на розум кволий; голова з вухами; бідний (небагатий) на розум; без голови; без [третьої (сьомої)] клепки [в голові (у тім’ї)]; як (мов, ніби і т. ін.) колода (ступа); нема (немає, бракує, не стало) кебети; лобом неширокий; не при своєму (при своїм) розумі (умі); дурне сало без хліба; не сповна розуму; умом убогий; не родить у черепку, deprec. ; курячий (короткий) розум, deprec. ; шкандибати на голову, deprec. ; не мати усіх дома, playf. ; пустий лоб, deprec. ; мати порожню макітру на плечах, deprec. ; пеньок (пень) з очима, fam. ; давати / дати зівка (1); битий у тім’я (2); порожньо в голові (у лобі) (2); Russ. умом убогий; богом убитый; глуп как пробка; глуп как сивый мерин; голова еловая; голова соломой набита; дубовая голова [башка]; дурья голова [башка]; мякинная голова [башка]; пустая голова [башка]; пороха не выдумает; набитый [круглый] дурак; петый дурак; олух царя небесного; пень березовый; как [будто, словно, точно] из-за угла мешком прибитый [ударенный, трахнутый]. · reckless: Ukr. без царя (без царка) в голові (1). · old age (Ukr. вижити / виживати з розуму (з ума)). The return of reasonable and sober perception of reality is represented by the PhSSG «Return to normal perception of the world» (Germ. j-m seinen Wahn benehmen; Ukr. прибрати себе до рук; скидати / скинути полуду з очей; Russ. падать с неба на землю; приходить в рассудок) and PhSSG «Help someone deprive of illusions, perceive the surrounding reality soberly» (Ukr. скинути з неба (з небес) на землю). PhAO «Mentally healthy – mentally ill» is implemented by PhSG «Mentally healthy» (be in one’s right mind; Germ. seine fünf Sinne beisammen haben; nicht bei Besinnung sein; Russ. в полном [здравом, твердом] рассудке; в своем уме) and PhSG «Mentally ill» (go out of (lose) one’s mind; (as) mad as a hatter (as a March hare); be out of one’s senses; (as) crazy as a loon; have (got) bats in one’s (the) belfry; take leave of one’s senses; (as) nutty as a fruitcake, fam. ; (as) balmy (barmy, mad) as a bandicoot; far gone (2); Germ. einen Knall haben (kriegen); im Kopf gestört sein (nicht ganz richtig im Kopf sein); schwach im Kopfe sein; Spatzen im Kopf haben; Herr seiner Sinne sein; eine weiche Birne haben; nicht ganz richtig oben sein; bei dem ist’s wohl nicht richtig im Oberstübchen; einen Klaps haben; des Kuckucks sein; bei ihm rappelt's (es rappelt bei ihm im Oberstübchen); bei dem ist eine Schraube los (locker); nicht recht bei Groschen sein, іron. ; er ist nicht ganz in Ordnung, іron. ; es ist hei ihm im Dachstübchen nicht ganz richtig, fam. ; einen Nagel (im Kopfe) haben (2); Ukr. з кіндратиком у голові; з глузду (з розуму) з’їхати (зсунутися, спасти і т. ін. ); прибитий [ще] на цвіту; рішитися (позбутися) розуму (ума, глузду); не при своїх; спасти (сплисти) з розуму; стратитися розуму; [не] в своїй сорочці (льолі), fam. ; зійти / сходити з ума (з розуму, з глузду) (1); [як (мов, неначе і т. ін.)] не при собі (2); Russ. тронутый умом [мозгами]; тронуться [повредиться] в уме [в рассудке]; тронуться [повредиться] умом [рассудком, мозгами]; мешаться в уме [в рассудке]; терять рассудок (1); лишиться [решиться] ума [рассудка] (2)). One of the causes of mental illness is aging: Russ. выживать из ума; впадать в детство. The structure of the mind value represents the mental qualities of the natural mind or its loss and is presented in the analyzed AWI by three phraseological axiological oppositions: the PhAO «Mental adequacy – mental inadequacy»; the PhAO «Return of ability to think reasonably – the loss of the ability to think reasonably» and the PhAO «Mentally healthy – mentally ill». Asymmetry towards negative evaluation can be observed in all languages. Much in common can be seen in the methods of evaluation: 1) the presence of the connotative seme of ‘depreciatingly’, ‘familiarly’ and ‘playful’ fixed by the phraseo-graphical sources in the composition of the phraseological meaning; 2) the presence of the associative components (somatisms, zoosemisms, phytocomponents, onyms, colouring, numerical and meteorological components) in the composition of the phraseological unit. However, in the means of expression the associational reflexive the specific is revealed (zoosemisms bandicoot, bat (English), cuckoo, goose (Germ. ), beetle (Ukr. ), gelding (Russ. ); phytocomponents nut (English), pear, kidney beans (Germ. ), cabbage (Ukr. ), spruce, Birch (Russ. ); meteorological components rain (English); onyms Billy, Colney Hatch (English), Hesse (Germ.) etc.). Alefirenko, Nikolaj. Lingvokul'turologiya: Tsennostno-Smyslovoye Prostranstvo Yazyka (Linguoculturology: the Value-Semantic Space of the Language). Moscow: Flinta; Nauka, 2010. Print. Babayeva, Elena. “Lingvokul'turologicheskiye Kharakteristiki Russkoy i Nemetskoy Aksiologicheskikh Kartin Mira (Linguistic and Cultural Characteristics of Russian and German Axiological Pictures of the World)’’. Diss. Volgograd State Pedagogical U, 2004. Abstract. Print. Batsuren, Renchin. “Otobrazheniye Universal'nykh i Etnospetsyficheskikh Chert Yazykovoy Kartiny Mira v Frazeologicheskikh Fondakh Angliyskogo, Russkogo i Mongol’skogo Yazykov (To Display Generic and Ethnospecific Traits of the Language Picture of the World in Phraseological Funds of English, Russian and Mongolian)’’. Diss. Saratov N.G. Chernyshevsky state U, 2010. Abstract. Print. Karasik, Vladimir. Yazykovoy Krug: Lichnost', Kontsepty, Diskurs (Language Circle: Personality, Concepts, Discourse). Volgograd: Peremena, 2002. Print. Krasnobaieva-Chorna, Zhanna. “Frazemna Aksiolohiya: Katehory`zatsiya i Rivneva Strukturovanist` (Phraseme Axiology: Categorization and Level Structuredness)’’. Diss. Odesa I. Mechnikov National U, 2017. Abstract. Print. Rus-Bryushynina, Iness-Valentina. “Osobennosti Yazykovoy Kontseptualizatsii Dukhovnykh Tsennostey Sotsiuma: Lingvokul'turnyy i Lingvostranovedcheskiy Aspekty: na Materiale Ispanskogo i Russkogo Yazykov (Features of the Language Conceptualization of the Spiritual Values of Society: Linguocultural and Linguistic-Cultural Aspects: on the Material of Spanish and Russian Languages)’’. Diss. Stavropol State U, 2010. Abstract. Print. Serebrennikova, Yelena. Lingvistika i Aksiologiya: Etnosemiometriya Tsennostnykh Smyslov (Linguistics and Axiology: Ethnosemiometry of Value Meanings). Moscow: Tezaurus, 2011. Print. Zimin, Valentin. “Otsenochno-Emotivnaya Ambivalentnost' Frazeologicheskikh Yedinits v Sovremennom Russkom Yazyke (Estimated-Emotional Ambivalence of Phraseological Units in Modern Russian)’’. Slovo: Fol'klorno-Dialektologicheskiy Al'manakh: Yazykoznaniye (Word: Folklore-Dialectological Almanac: Linguistics) 3 (2005): 5–6. Print. 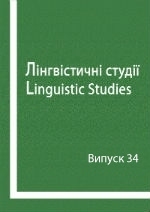 Slovnyk frazeolohizmiv Ukrayins’koyi Movy (Dictionary of phraseological units of Ukrainian). Kyiv: Naukova dumka. 2003. Print. Frazeologicheskii Slovar’ Russkogo Yazyka (Phraseological dictionary of Russian). Moskva: Sovetskaya entsiklopediya. 1987. Print. Надійшла до редакції 16 вересня 2017 року.